Off The Avenue at the Radley end of the village of Kennington is a 12½ acre field dedicated to the memory of the six men of the village killed in the Second World War. This is in addition to the Memorial Cross near St Swithun’s Church in the centre of the village. Mrs Sarah Kirk, the mother of one of those who died, instigated fundraising to buy the field for £1000 jointly with the Oxford Preservation Trust, whose secretary at the time was John, later Sir John, Betjeman. 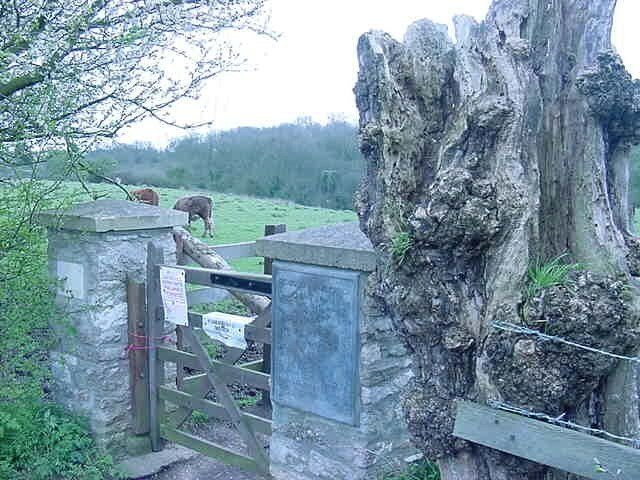 Three bronze plaques, designed by Thomas Rayson, the Oxford artist and architect, are placed at gates into the field. The Kennington Memorial Field is owned and managed by Oxford Preservation Trust, which maintains the field as an area of natural open space with permissive public access. The field has been designated as a local wildlife site for its species-rich grassland. It is managed traditionally by grazing with about half a dozen cattle in the field from spring to late summer each year. The Field slopes in a southerly direction to a stream flanked by extensive woodland as well as a wooded area on its western boundary. Consequently the inhabitants of the woods, foxes, muntjac and other deer, grey squirrels and a large variety of birds including the green and spotted woodpecker can be seen and heard in the Field. There is ample variety of wild flowers with expanses of purple violets in early spring followed by a few cowslips and a few well-hidden bee orchids. By June vivid buttercups are in abundance and fragrant may-blossom and wild roses give their prelude of autumn’s hips and haws. At the height of summer there will be agrimony, vetch and knapweed, which are just a few of the myriad of wild flowers to be found. Quaking grass clothes one sunny bank to enhance a preponderance of dog-daises in that spot. With such a wealth of flora the Field holds an attraction to butterflies, the common blue, the brown hairstreak, orange tip and clouded yellow constitute the many to be seen there. As well as the aesthetic attractions of the Field, late summer brings blackberries, hazel nuts and a few mushrooms to gather. Here is a haven of peace where old and young can walk and sit, dogs and children run and safely roam in the village of Kennington where so much of the hitherto open space has now succumbed to development.